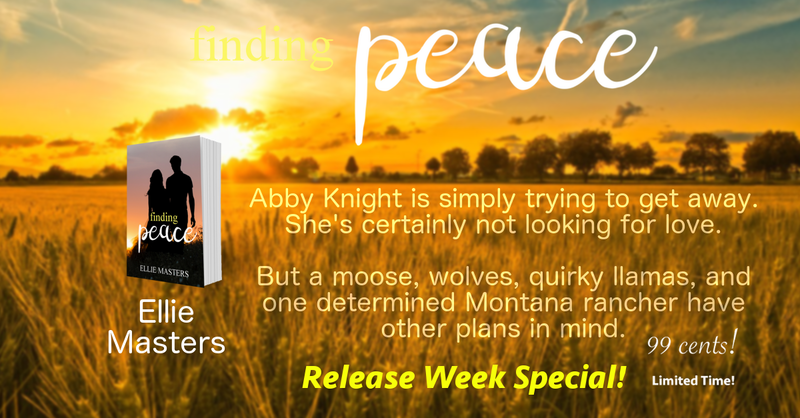 Finding Peace is the first in the new series by Ellie Masters. It’s a novella, a perfect bedtime story. I love the forewords she always has in her novels. I think it’s cute and caring gesture towards her readers, always with some encouranging words. Abigail has just graduated med-school and is on her way to be a part of her uncle’s family practice. She’s actually glad to get to get away from the abusive relationships that she’s been in. Her uncle is all there is for her, her parents are dead and the relationships she is in, is slowly killing her. So she was glad that her uncle made the decision for her when he asked her to come down to Montana. The sparks fly in the air, Drake and Abby are inevitably drawn to each other. Their chemistry is instant. “I’m not a gentle man,” he said with a growl. Ellie Masters has written a beautiful beginning to a love story, because that’s what this is, just the beginning. It’s is romantic, it is hot. What intrigued me most was Abby’s inheritance, the ten thousand acres of land that has been the birth right of the first born female. And Abigail is the last female in the McFearson line. I want to know what secrets are written in the old journal. All this was left a bit of a mystery I hope to unravel when the series proceed. Previous PostAndi Copeland: Oracle IS LIVE!